Lately my hair has not felt the same. Maybe it’s just me being paranoid, but something is not right. One thing that has been bothering me is people telling me that my hair has gotten shorter. I shouldn’t be because when I comb it I have less hair shed then ever before. I usually tell them it’s just shrinkage. However it does feel as if my hair is stunted. I dyed it 6 months ago and usually I see a lot of dark roots by now but it’s not the same amount like in the past. I individual two strand twisted my hair today and it seems a lot shorter then the past. Usually my hair drapes my shoulders, curls up real pretty on the ends and moves with out any stiffness. I washed my hair last night with apple cider vinegar and a shampoo and conditioner my sister gave me samples of. I’m not sure of the name right now. All I know is I used the same name brands body lotion once and it was amazing. I had gotten the body lotion for free at a bridal expo. So when my sister gave me the shampoo sample I was open to try it. I was in a hurry so I did not deep condition like I have been for years. I also didn’t add the melted Shea butter and mixing it with vitamin E and putting it into my hair. I’m still using dark and lovely’s au natural curling stuff. It smells nice but its not very special. Their products are supposed to be anti shrinkage but today my hair admittedly seems a lot shorter. What is happening with my hair? I’m a little paranoids about noticeable hair loss because weather she likes to admit it my mom suffers from alopecia. When I was in high school my mom would get our hair done twice a week. She liked the big French roll up do’s that she use to do in the 60s that had become popular in the 90s. Only one problem. Years of straightening her hair with perms had broken it off and made it thin and short. When my mother was young she always used hot combs. Her hair was long like down her back to mid back. Back then she always wore her hair up in a French roll. Then in the 90s my sister Marcia started asking for a perm because she was being made fun of. So we all went to the beauty shop with our long back length pressed hair got perms and it all fell out. My mom got the worst of it. So when the French roll came back in style she wanted that style again but she did not have enough hair. So our beautician at the time started gluing hair into my moms scalp and she started going bald. She always tells people its because she had cancer but her hair had fallen out long before they found the cancer. Plus she has been blessed to never have had any chemo therapy even after two bouts with cancer. She tell people her hair came out because of this because she is shame of how silly she was to trust that beautician and now she has no hair. Lately she has been picking on me about my hair. She never wanted me or my sister to go natural. She told us that we would never get men or jobs no one will want us and she’s just looking out for us. Well my sisters a prominent journalist with a husband and baby and I’m getting married on the 22nd of this month so we proved her wrong. But now she fusses that I do my hair to much. ( I do it once a week) and she believes all those tuck and roll protect your ends styles are going to make my hair come out. She says my hair is long and it will get short if I keep tucking my ends under. I don’t do it all the time just most of the time. 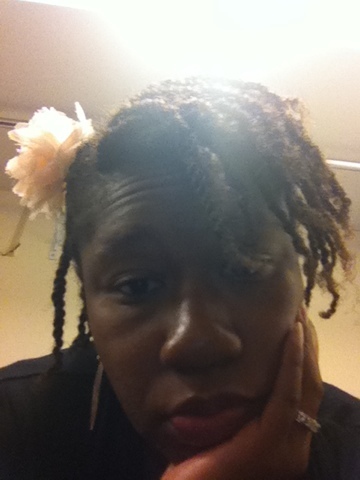 Now my hair seems shorter when I do twists my old go to hairstyle. I’m worried my hair is coming out like my moms and I’m creating traction alopecia. I’m also worried its generic and one day I’m going to wake up with no hair. My scalp seems sore at times and I really don’t know why. I’m trying to uses as little tension as possible. I’m worried, and if my hair does come out my mom will be there to say I told you so like always. She love being able to get the chance to say that to anyone in our family SMH.